We started this company nearly 40 years ago. Over the past 37 years, we’ve watched beverages and beverage machine technology grow and evolve, keeping up with industry trends without sacrificing our old-school, customer-first approach. Tognazzini Beverage Service carries some of the most widely recognized products available, including Coca- Cola, Hoshizaki, Micromatic, Perlick, Lancer, and many more! We also offer a variety of fruit juices, syrups, accessories, and everything in between. As a family-operated company, we place a special priority on making sure each customer feels satisfied with the service we provide, from the moment they call us until the moment we part ways. We’ll give you the attention you and your business deserve. Tognazzini Beverage Service is the largest fountain beverage distributor on the central coast of California. In business since 1981, we strive to provide quality distribution services that make our customers happy and earn us their business for life. We boast an inventory which includes some of the highest-quality beverage equipment in the industry. Our logistical experience means you can expect us to deliver exactly what you need when you need it. We operate as a beverage service for many different markets including national chains, local markets, healthcare, corporate and sole proprietorships, institutions, agriculture, water treatment, and more. We offer delicious, cost-effective beverages and beverage equipment for bars, parties, businesses and more. Our broad array of nationally known products includes Coca-Cola, Dr. Pepper, 7-Up, Canada Dry, Turbo Energy Drinks and more. Tognazzini also has the equipment to create new custom beverage syrups for those clients looking to offer a unique flavor of their own. Simply put, we represent the best this industry has to offer. Give us a call today! 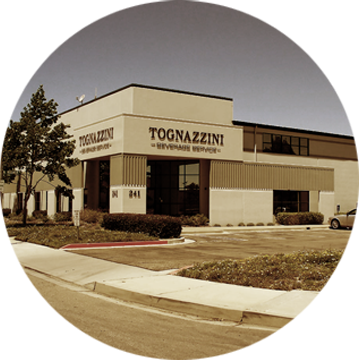 We founded Tognazzini Beverage Service in 1981. For over 37 years, we’ve dedicated ourselves to satisfying our growing clientele across California. As a family-owned, family-operated company, we place a premium on treating our customers with the respect and dignity they deserve, making fruitful connections that earn us their business for life. It’s just one testament to our continued quality of service that Tognazzini Beverage Service has an A+ rating from the Better Business Bureau. Between our wide product inventory, personalized customer service, and extensive logistical experience, we offer some of the best service this industry has to offer. Call today to see what Tognazzini can do for you!